The Girlie Show Friday night: busy and bustling. Photo by Helen Grant. 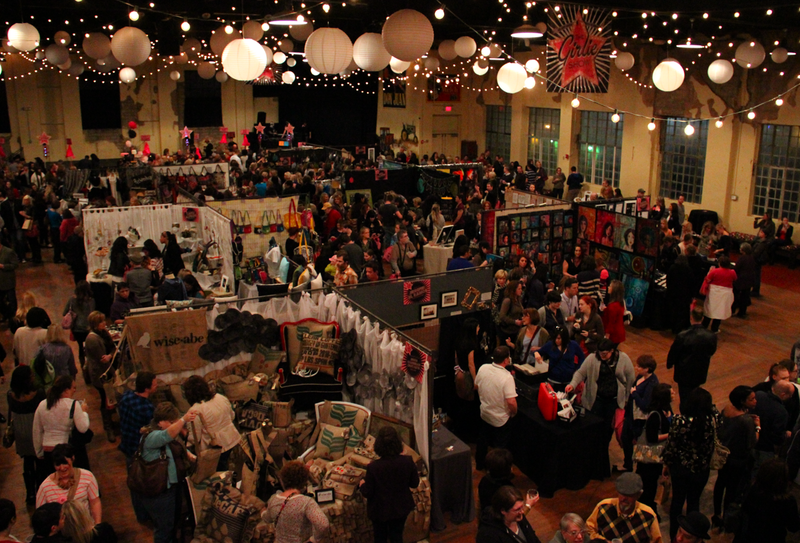 The Girlie Show was as busy as ever Friday night as attendees filed into the OKC Public Farmer’s Market off Klein St in OKC to shop the booths of new and returning female crafters and artisans. Even in The Girlie Show’s 8th year, the organizers kept the mix fresh and lively. The line wrapped around the entire building; after skipping to the head of the line with my press pass, though, I wandered in with my friend Angela Nooner. An oncology nurse at OU by day, I drafted Angela into the service of OKC.net. After navigating our way through the mass of humanity eagerly waiting to get in, we sampled the many delights on the upper and lower floors. Angela said she loved the strawberry shortcake, but zeroed in on Sara Sara’s red velvet cupcakes. One could eat an entire dinner’s worth of international goodies and then top it all off with sinfully delicious desserts. Upstairs, the fare ranged from JeonJu to Sara, Sara Cupcakes, Trattaoria il Centro, Luxy Cupcakes, and many, many more. On the first floor, the catered (and crowded) tables included Irma’s Burgers, Mutts, and Big Truck Tacos. 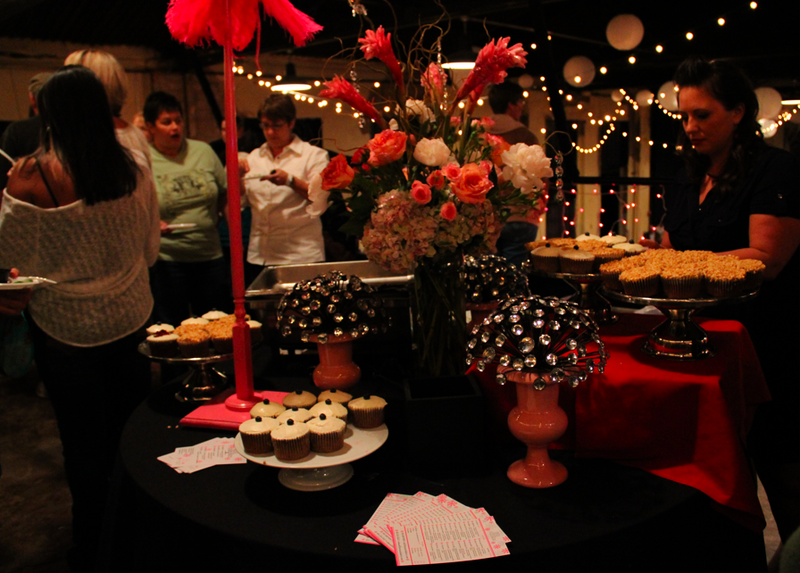 Sara Sara Cupcakes and many other bakeries and restaurants catered The Girlie Show Friday night. Photo by Helen Grant. Once Angela and I were sure that we couldn’t possibly eat another chocolate tart or pop another tasty, tasty piece of dragon roll from Tokyo’s sushi table, we made our way through the bustling crowds and chatted with a few of the artists. The first stop was the Vandroid booth. Artist Vanessa Painter is from Tulsa. To support her growing collection of antique metal robots, she photographs them and then digitally paints over the images to produce a unique work of art. The pictures are then printed on canvas, mounted, and sealed. I loved them, and couldn’t resist buying one. Painter’s canvas pieces range from $25-125. She also sells prints and cards. 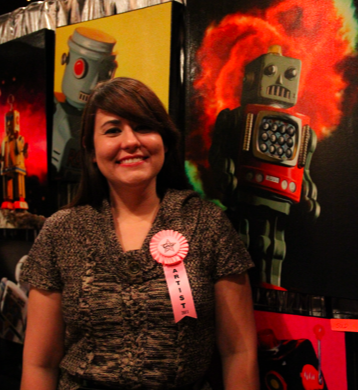 Vanessa Painter is the force that powers Vandroid. Check her out at www.vandroid.esty.com. Photo by Helen Grant. We wandered around more, taking in the sights and sounds of the evening. Even though (and perhaps because) it was packed, one could not ask for a better people-watching event. Over the course of people-watching we spotted the feathered pink ladies; you couldn’t miss seeing these showy lasses from the balcony. As the feathered pink ladies made their rounds, they stopped ever so gracefully to take photos with the many attendees eager to get a good pic. Angela was not only game, she had been wearing the perfect shade of pink. At The Girlie Show there is no such thing as too much pink (or too many feathers, for that matter). Photo by Helen Grant. Once we had arrived at our feather quota, we began to check out more of the the booths. One of the great things about this event is that, no matter how many jewelry makers, painters, and myriad of other artisans showcasing their craft, every piece is highly individual. Even booths that share a similar level of attention to detail, for instance fine jewelry design, had unique pieces and styles that there was little chance of mistaking one artist’s work for another. The Girlie Show’s popularity continues to grow as word of the event spreads to other states. And although there are a lot of Oklahoma artists, there are a few that make the yearly trek to OKC because of this event. Jewelry artist Annie Huntley is from Seattle, Washington and travels the globe in search of jewelry findings to incorporate in her designs. Huntley said this was her fourth time to return to The Girlie show, and that she loves coming to OKC because this event is easily one of her better shows in the year. 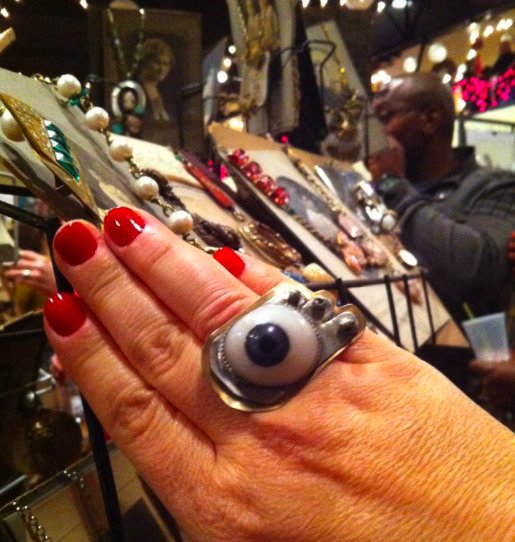 Others I talked to included jewelry mavens from Texas such as Skip 2 My Lou’s Janet Waldrop, HiFi Jewelry’s Jacky Sylvie, and the ladies of f. is for frank: Shoshannah Frank and Casey Melton. There are people from Kansas, Illinois, Arkansas, New York, and a handful of other states as well. Even so, the majority of artists are Oklahoma girlies. I made my rounds, but there were a few booths on Friday and Saturday that kept drawing my attention. One that had been consistently crowded Friday night was the Gleeful Peacock booth. The Gleeful Peacock is owned by Tulsan Nikki Halgren. 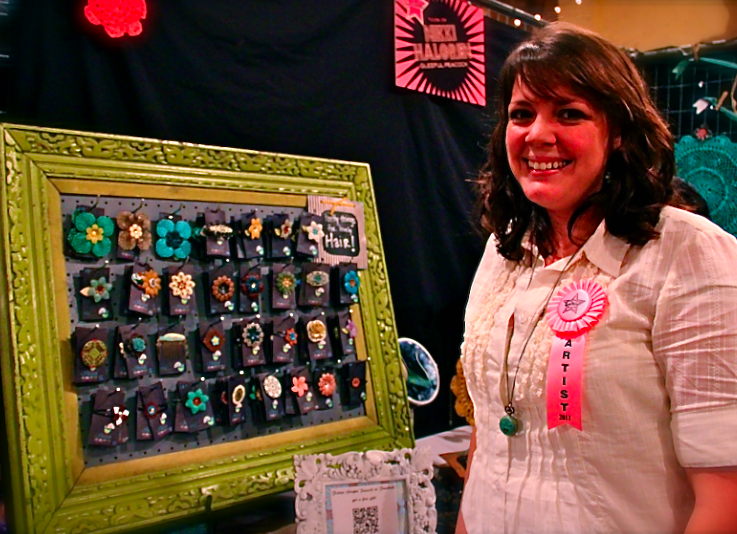 She said this was her first time at The Girlie Show, and that her specialty is hand painted metal jewelry and accessories. She’s operated her business for the last two years; her pieces can be found at The Collected Thread in the Plaza District, and at Birdie in Norman. Nikki Halgren owns the Gleeful Peacock. Her specialty is hand painted metal jewelry and accessories. Photo by Helen Grant. We also stopped by Norman gal Laurie Ingalls’s booth Lumpy Bits on Friday and Saturday too; it has a selection of dolls and hats unlike any other. Christine Sharp-Crowe, a fabric artist from Tulsa, had an assortment of framed screen prints, pillows and other cool items at her booth Weather and Noise. Painter and ceramic artist Ruth Borum-Loveland of Norman was back for her fifth year at The Girlie Show, and had clothing in addition to her paintings, wood burned pieces, and ceramic bowls. Funnily enough, across from Gleeful Peacock, there was another booth that really caught my attention too. 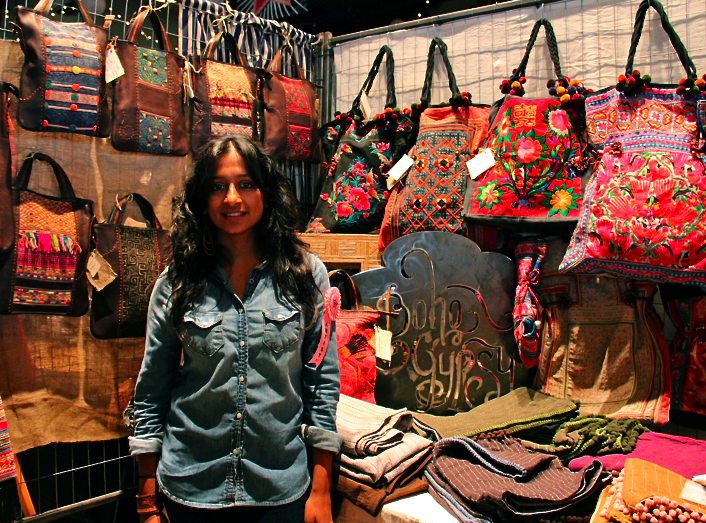 Boho Gypsy is owned by Annah Chakola Ramsey. While not originally a native of Oklahoma, she moved here four years ago with her husband. What I loved most about the Boho Gypsy booth was that Ramsey, like many others, travels the world in search of particularly unique materials. She does not use factories to produce her jewelry and accessories, and she will travel as far as Thailand to find fair trade materials and artisan labor. When not doing shows like The Girlie Show, Ramsey also books trunk sales. Boho Gypsy is the product of Annah Chakola Ramsey's imagination and design. Her business practice is to find fair trade materials and establish working relationships with other small business owners in other countries. Photo by Helen Grant. The difference between Friday and Saturday is amazing. On Friday it’s a mad house with thumping music and crowds of people. But come Saturday the DJs have been replaced with live performances by female musicians. Even more notable: you can walk around without worrying about running into someone. That said, Saturday is a little tricky. Friday’s ticket gets you in on Saturday, but gone is the smorgasbord of OKC’s finest restaurants and bakeries. Instead you pay for food at the concession tables while shopping. Drinks are still available, but those were never free, so no loss there. Waiting till Saturday to attend also has one slight drawback: there’s a chance you missed out on a really great find. But here’s the deal, come closing time on Saturday you can bargain with these ladies if they haven’t already started marking down their prices. Simply put, Saturday is a day of trade-offs. It’s also the day to come back, if you went Friday night, to see if you really needed that taxidermy eye ball ring going for $200. OKC.net photographer Lynne Rostochil’s had this very dilemma. "Here's looking at you kid. ", "A game of Eye spy, anyone? ", "The eyes have it." --- just imagine the long list of conversation starters, puns, and comments that could be had. EYE hope she went back for it. Photo by Helen Grant. At any rate, The Girlie Show is one of those annual OKC events no one with a pink streak should miss. To my knowledge there is not another event in OKC that even comes close to the same level of empowered female indie fanfare like that of The Girlie Show. The women who debut or return to the show do it because they love the community engendered by The Girlie Show as much as they love the business side. That the show continues to do so well says a lot about the women of Oklahoma and how much we appreciate our new, returning, and visiting artisans. Didn’t get enough pictures? There’s more! Tagged Annah Chakola Ramsey, Boho Gypsy, community, Friday, Gleeful Peacock, Klein St, Laurie Ingalls, Luxy Cupcakes, OKC, produce, Sara Sara Cupcakes, Thailand, Tokyo, Tulsa. Bookmark the permalink. Great job, Helen! I LOVE Weather and Noise, and have several of her pieces at home and gave some as Christmas presents as well. I’m so sad that I was too sick to attend this year.